We joined a ReachGlobal group going upriver on the Uciyali to provide medical care in Shapibo villages that have no access to healthcare. This group, from Hershey Evangelical Free Church, will spend two days traveling before reaching their seven village destination then spend a week going from village to village providing care along with the Gospel. 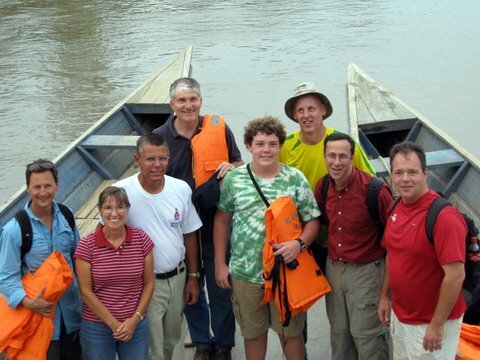 We essentially hitched a ride for a couple of hours then we jumped ship onto a chulapa (large motorized canoe) and went back to Pucallpa to spend an evening with our partner church pastoral staff. Pictured here are ReachGlobal personnel and two pastors from Trinity Church who have come on this trip to learn more about what is happening in missions in Peru.